Boris Johnson has referred to the Treasury as the “heart of Remain” and called for “guts” in Brexit talks in comments made at a private dinner. The foreign secretary also warned there may be a Brexit “meltdown”, according to a recording obtained by Buzzfeed. Speaking to campaign group Conservative Way Forward, he said fear of initial disruption meant the Treasury was sacrificing long-term gains. Friends of Mr Johnson said they were disappointed he had been recorded. The foreign secretary was apparently speaking to around 20 people in a private room after an Institute of Directors reception on Wednesday night. What’s the big picture behind Brexit ‘backstop’ drama? According to Buzzfeed, he said that the prime minister was “going to go into a phase where we are much more combative with Brussels”. Brexit will be “irreversible” and will happen, Mr Johnson said, but the “risk is that it will not be the one we want”. He was said to have described concerns over the border between Northern Ireland and the Irish Republic as “pure millennium bug stuff” and suggested Chancellor Philip Hammond’s department was “basically the heart of Remain”. The comments emerged after a day which saw the prime minister involved in a cabinet row over the government’s “backstop” plan on customs. Reality Check: What do Brexit backstop proposals mean? 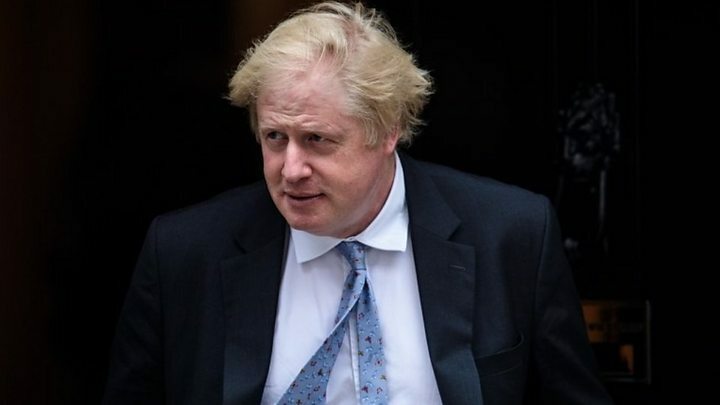 The sentiments expressed might be unsurprising, but in colourful language and with devastating timing, Boris Johnson becomes the second cabinet minister in 24 hours to throw the prime minister’s authority into the pestle and mortar and pummel away. His friends say he’s disappointed the remarks were covertly recorded. But it’s not surprising they were. So first there was the Brexit Secretary hokey cokey: David Davis saying it is my way or the stairway (to the backbenches), and doing so in a way where, depending whether it was 10:00 or 11:00, he was either in the cabinet or about to be out. And now this. Johnsonian expression, including obligatory flourishes in Latin, which amounts to the same thing: a flexing of Brexiteer muscle in the direction of a prime minister desperate to hold her cabinet, her party and the country together. It’s one heck of a job. Mr Johnson was the keynote speaker at Conservative Way Forward’s summer reception and took questions for more than an hour – with other Conservative MPs, including Priti Patel and Conor Burns, present – according to Buzzfeed. Asked about Donald Trump, he said he was “increasingly admiring” of the US President, who is preparing for an historic summit with North Korea’s leader Kim Jong-un. “Imagine Trump doing Brexit,” he added. “He’d go in bloody hard… There’d be all sorts of breakdowns, all sorts of chaos. Everyone would think he’d gone mad. But actually you might get somewhere.